Taking three first places, Porsche has cleaned up in the 'Best Cars 2015' readers' poll. A total of 112,471 readers of the German magazine 'auto motor sport' voted for the best cars of the year – and made Porsche the big winner! For the third time in succession, the 911 Carrera beat of all rivals in the 'Sports Car' category, polling 28.5 per cent of the vote. The winner in the 'Cabriolet' category is the 911 Cabrio/Targa with 12.5 per cent of the readers' votes. The Porsche Macan took first place in the 4-wheel drive / large SUV segment, thus completing the brand's impressive performance in 'Best Cars 2015'. 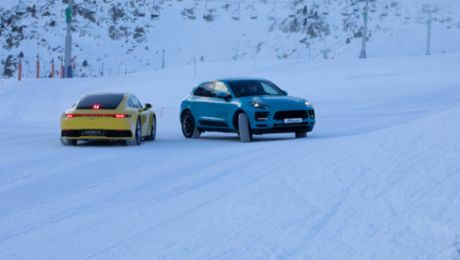 What better way to test the power and traction of the new 911, than by sending it up a ski slope? The first all-electric compact SUV from Porsche is due to roll off the assembly line at the start of the next decade. The new 911 Cabriolet comes with an all-new, unique hood. 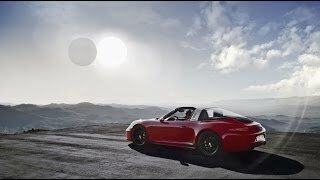 The new 911 Targa 4 GTS - All that matters.